VD's Swaps - Engi no Jutsu - The Best Naruto RP on the Net! A basic technique, Ryuusei makes up for his lack of formal hand-to-hand training with a brawling punch. It's aim is to launch the opponent airborne for follow-up attacks, but regardless of how it hits, it hits. Regardless of Ryuusei's stance (if he's sturdy, standing on a wall, falling through the air) he finds his center, focuses on a single opponent, and explodes forward with his right fist, chakra visable in spiraling streams as he slams forward. If possible, this becomes an uppercut to launch the opponent skyward. However, if Ryuusei is airborne or just in a situation where up isn't an option, it's a horribly fierce punch set to launch the opponent away from the attack. - This technique will be part of a chain, for further techinques down the line. Ryuusei has the option to use his left hand if he's wielding his weapon, or even punch with sword in hand. Last edited by Shinji; 11-18-2008 at 10:46 PM..
Combo Special: The Silent Killer is a master of stealth. Once per target per thread, he can approach a target undetected. This stealth effect is broken upon taking any offensive action, but otherwise continues as long as the Silent Killer remains in cover. Description: A common skill amongst swordsmen from Kirigakure no Sato, the Silent Killing technique describes a way to take advantage of cover for a silent approach. Last edited by Virtual Dream; 01-10-2014 at 05:09 PM.. The Chakra Kisei, sometimes known as a Coil Parasite, is widely regarded to be simple folk lore and an obscure tale that was intended to warn reckless young shinobi of the dangers of the Gahou Glades. The story attests that inexperienced ninja can enter the glades and become beset by difficult to sense beasts that slip through the pores of the skin and latch onto the chakra coil system of fresh shinobi, damning them to a lackluster shinobi career and eventually an early death. The Coil Parasite is said to be nigh undetectable to all but the most powerful of medical techniques, and practically impossible to remove. While most would agree that this story serves only the purpose of warding away novice explorers from Grass Country's more prolific (and dangerous) regions, as with most tales of woe and superstition, it holds it's roots in truth. The Path of the Southern Gate is a seal designed to attract, secure, and lay host to the Coil Parasite—and it's a spectacular failure. The seal itself takes the form of three small bruises on the hip, in the vague shape of a human skull (at least the silhouettes of the eye and nose sockets), at a lazy angle. As it opens up around the user, these bruises take on the shape of a grinning skull and trace along the body in spiraling patterns, much like a snake. In particular, they wrap up around the back and down the right arm in earlier stages, before consuming the body entirely. In the Gahou Glades of Grass Country, there exists a very small region of space with a unique ecosystem--this ecosystem is made up mostly thanks to very unique mushrooms and pollen, and changes with every blooming year based on spread and sunlight and many other factors, meaning it's been growing, dying, and regrowing elsewhere, unknown to many. Considering there's a twenty year lapse between each generation of this small pocket ecosystem, most people in the fields of study relevant to Gahou Glade's ecosystem tend to dismiss the claims as rumor or science fiction. But in this small pocket ecosystem that appears once every twenty years, the Coil Parasite thrives. The Coil Parasite doesn't have a physical body, existing purely in chakra form, and they swarm and choke out the unique mushrooms that grow in this ecosystem, reach the end of the mushrooms life, and explode into egg sacs as they die with their home. These egg sacs, existing on such a small scale outside of what is considered the physical realm, lay dormant until the mushroom grows again. This ecosystem is known by those who believe in it as the "Southern Gate", referencing the fact that it seems to be something otherworldly. The Path to the Southern Gate was intended to be a seal to harvest, collect, and grow the coil parasites, either to use them in medicine or weaponize them. If the seal was created by a Grass shinobi, it was done in secret, by a genius ashamed of their obsession. If the seal was created by the Naga, which is likely by the body-horror style, then it's a secret to everybody. Regardless of who made it, the fact of the matter was that the Gahou Glades are dangerous and the ecosystem only exists two to four times in the average person's lifetime, and even with an extended one, there's rarely enough time to properly study it. So, the seal was made to grow alongside the host--and the younger the host, the better. The seal was applied to a newborn infant. The seal's primary function exposed the chakra coil system of the infant to the outside world, and then twisted and mutated the internal atmosphere of the body, both on the spiritual chakra side and the physical human side. This atmosphere was considered as close as possible to the ecosystem of the Southern Gate. This seal, then, was the pathway. The child was left in this patch of ecosystem, and the coil parasites delighted to find such a ripe and nutritious area to do their living, so they swarmed towards it. The seal was effective at replicating the ecosystem, but the seal was out of control, killing the child's body and coil network in exchange for a few precious hours of studying the parasite up close and personal. The creator of the seal dismissed his/her/their work and left the infant to die as the ecosystem started to break down. The parasites, left in this atmosphere of ideal conditions, gorged themselves on the chakra network before them. Normally, they'd take a bit of chakra from a special mushroom, reproduce asexually, and die, but this was a variable buffet. The parasites lived well beyond their lifespan, choking out the chakra system of the host. Eventually, the infant simply had no more for them to eat, so they turned on each other, crazed and instincts going haywire in the cursed seal environment. When it was all over, only one coil parasite remained, and he nested deep in what would eventually develop into a womb, sapping chakra and nutrients away. As the years passed, the Coil Parasite grew alongside the host. With each year, her body grew stronger and her chakra coils became more robust, more delicious--the seal had changed her body, made it relevant to his lifestyle. Artificially extended his lifespan. In some ways, he was taking on the traits of the host--gaining intelligence, gaining strength. Expanding in size--thousands of little legs like on a millipede grew out from his tapeworm like body and embedded themselves into the chakra coil network. Somewhere in the central nervous system of the beast, sentience formed. Eventually, the girl would learn that her curse seal did more than make her a lackluster ninja--she would learn of the monster inside of her. His intelligence would eventually reach out to her own. His was an alien thought-pattern, driven by base instinct and greed for a host's chakra, but her's was calm and collected, well-studied and driven by ambition. Together, they met in the middle. The Coil Parasite and the Shinobi would eventually learn to communicate. And thus, the techniques of this seal. Physical Description: A serrated series of hooks for a face, too many oval eyes with too many eyes inside of those, and a long, serpent-like body made of serrated armor. The beast has grown alongside the chakra coil system of the host, and at full length, would be several dozen feet long! But he can't survive outside of the atmosphere of the seal for long, normally only peeking out his head or tail to assist his host. He's monstrous and alien in every sense of the term---a Coil Parasite. The Parasite living in the user can dip in and out of the material plane by forming a body out of the Host's flesh. When appearing, it has the appearance of a terrifying visage of a tapeworm--compound eyes surrounding a gaping hole of a mouth, filled with teeth and serrated hooks. It's tail is a long, slender affair and has a barbed hook end. In some ways, it can be manipulated like a kusarigama might. The parasite can extend its limbs out up to four arm lengths away from the Host, using it's mouth to bite and maim or it's tail to slash and puncture. It acts as a part of the body and shares taijutsu stats with the host. The parasite can also extend small skittering legs, extra eyes, and even small baby parasites. The parasite can produce effects as the Shinobi Kit. Multiple living "Kusarigama" like appendages. Can replicate any item of the shinobi kit on the fly. Immunity to all natural, non weaponized poisons, and a two-post delay on any weaponized ones. The Parasite can communicate to the Host, offering information about the state of the shinobi's body. This includes the infiltration of poisons, damage, and any weird effects going on. The Parasite can even root around for embedded damage, like broken kunai bits, and push them out. The Parasite can also regulate the body, and assist in efficiently burning fat, cooling and warming, and even keep watch while the shinobi sleeps. Use of the Parasite's limbs don't have to be purely combative. They can be used to assist in climbing, peer around corners for vision, for simply picking up items, wrapping around equipment to protect theft, and so on. The user can register swaps, putting them in any Global or Village list they take. Any damage done to the Parasite's combative heads reflect back on the Host through their connected circulatory and chakra systems--getting stabbed in the parasite is the same as getting stabbed in the arm, for instance. Genjutsu cast on the shinobi affects the parasite just as well. For purposes of purchasing taijutsu, this list counts as one. The user's body is weak by peer standards, and uses the next stage down for taijutsu scaling--Chuunin scale as Genin, and Genin only scale to 1. This seal is considered incredibly taboo, and is normally kept in secret. Most of the higher ups--especially medical teams--are at least familiar with the concept in passing. Ninjutsu clones cannot activate or use the parasite, but can have the curse mark painted on them. Genjutsu clones work as normal. The Host must eat for both her own and the parasite's nutrition, so she she appears to casually eat enough for several well-bodied men..and still feels hungry. If a technique or attack involves force-feeding the shinobi, it works as normal, however. While unconscious or otherwise sleeping, it's possible for the parasite to take control of the Host's body in a limited fashion. Chakra molding, taijutsu, and anything remotely combative or acrobatic is completely out--gorging on food and submerging in water, pleasures for the worm, are in. This doesn't apply in combative threads where it might be seen as an advantage. Along these same lines, the Parasite can jack the Host's vocal chords. Not having a speechbox of his own, and the fact that all of his 'higher' communication is done through pseudo-telepathy, means the vocabulary is incredibly basic...and embarrassing for the host. The intent is that for the cost of the list, you have this parasite that has the functions listed in benefits--meaning it can replicate shinobi kit items, it has the head and tail that can be used for kusarigama action, and the poison filtering. Swaps would be for things like using the parasite to launch senbon or cloning it's heads, like the original seal had. Those would be rated on a jutsu-by-jutsu basis in relation to this seal. So effectively, I'm asking for extra weird limb things and a refluff of my shinobi kit and the ability to make swaps based on those weird limb things, in exchange for the weaknesses of the seal. To clarify, his seal costs a list and a jutsu, as normal. The basic state of the seal (that you get by purchasing it) allows you to manifest the parasite up to four arm lengths away from the user, striking with the head (which can bite) or the tail (which is barbed). This is functionally a living Kusarigama. The other aspect is that my shinobi kit on my character would be internal--that is to say, she can use the parasite to make her smokebombs or projectiles or whatever. These functions exactly like their shinobi kit versions. Lastly, she gets the immunity to poisons. The 'formless' stuff is using the 'living weapon' to interact with the world, since it's capable of grabbing things, coiling around them, and so on---so she could eject it to climb a wall (like you could with a kusarigama) or use the parasite's body to push her around (using her own speed stat) like you might with a heavy kusarigama, that sort of thing. 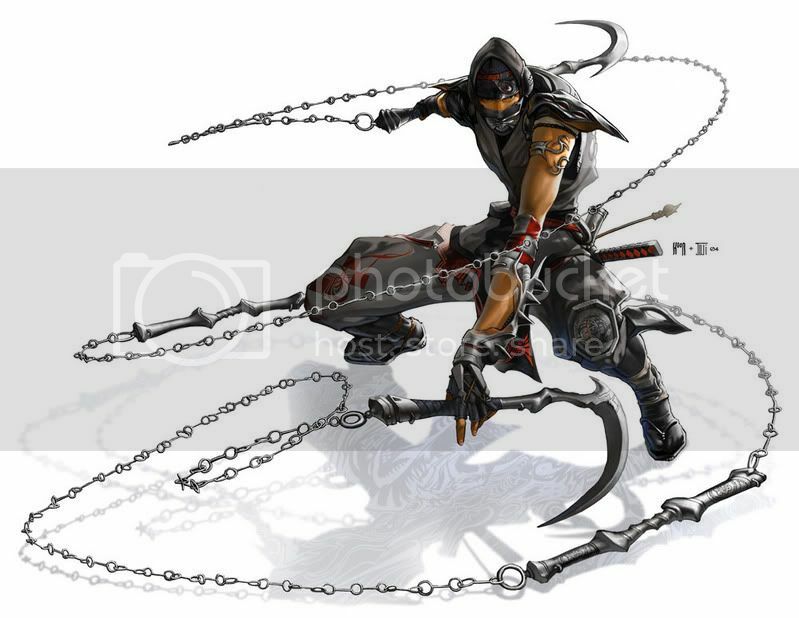 Effectively, the kusarigama-like parasite becomes an extra limb. Swaps would allow her to do things like forcefully eject projectiles, grapple and capture someone a la Iron Chains, send out little parasite spies, etc--do things that you couldn't do with a kusarigama or shinobi kit. The PRIMARY thing I plan to register is a way to duplicate the number of heads/tails she has access too, which I think is better suited as a higher-level swap so it has a distinctive uses-per-thread, since having twelve eight-some foot limbs, like the original seal, is a bit much. Last edited by Virtual Dream; 04-10-2014 at 07:08 PM.. If there is even the slightest possibility that the character's current guardians are responsible, I think that would be obvious. You don't just oops create a seal to house a possibly fake chakra monster that has a breeding cycle like a cicada. You know what I'm saying? They are probably a little eccentric. Thing is, this is the seal, not the character's biography, so that isn't to be argued here. Must be taken at creation of pet. The homunculus is a type of artificial human created by a profane and secret Naga ritual involving human sacrifice, similar in nature to the forgotten technique Edo Tensei. Using a focus made of the DNA sample of a genetic ancestor, a "potential human" was made, a false ancestor soul-bound to the host. This ritual was only once successful, taking the lives of the two Naga researchers assisting the host. The homunculus can be sealed in a large scroll with no ill-effects to the beast. A homunculus doesn't comprehend pain, and can continue to fight until otherwise disabled. If killed, rather than attempting to recreate the deadly and impossible situation that created it, a simpler reconstruction can be completed following regular beast master rules. Without traits that determine otherwise, the homunculus has an extremely limited command of language, only able to provide single word communication similar to any other intelligent ninja beast. ("Scary," "Hungry," "Angry," "Die," etc.) The beast master can still understand the homunculus as they would any other beast pet. Swaps for my upcoming Stone Jounin, Sajime Sahori. Byakko has a human form, and she can shift between the two at will. She counts as a miko, using the miko rules for jutsu selection (no ninjutsu or genjutsu) as well as gaining independent miko usages. The caster offers prayers to the moon, tracing an octogram before them while calling out the astrological mansions of the Byakko constellations (Kui, Lou, Wei, Mao, Bi, Zi, Shen, Byakko!) A powerful roar reverberates as the octogram illuminates before the caster, which the user (the caster or an ally) jumps through, cloaked in a gossamer courtly kimono (junihitoe), resplendent in silver moonlight made cloth, and the Chinese symbol for “king” emblazoned on their forehead. While wearing the kimono, the user’s speed and strength scaling levels are increased by Byakko, White Tiger of the West’s miko level, and their attacks count as ninjutsu (for the purposes of defeating defenses) equal to Byakko, White Tiger of the West’s miko level. Every post the kimono is active counts as a jutsu usage of the same stage (5) from the caster. When the kimono expires, the user suffers a negative penalty equal to the the same boon they achieved from the kimono to their speed and strength as the moonlight fabric becomes (non-valuable) metal, wrapping around the user. This penalty is removed after half as many posts as the benefits were active. Targeting earth she’s already manipulated with a Doton previously, Sahori makes a symbol of release with her hands, calling out “Katsu!”, the earth explodes with the force of five explosive tags. Manipulating the earth an area around a target within 50 feet of her, four spiked shoots of earth launch from the four cardinal directions to impale the target in the middle. Coming from four directions at once makes this technique notably difficult to evade, but they always come from the four cardinal directions (north, east, west, south), making it easier to evade once the trick is discovered. When activating her divergence, Ranko's throat glows with an eerie bright light. Commands to "Help me, rescue me, protect me" are especially effective, overwhelming the influenced with a singular goal to protect the Monarch. Basically, it overwrites their nindo (or equivalent) to "I will protect Keisei Ranko." For those that Ranko already holds powerful sway over (her Retainers, loyalist members of her schools, her Keisei Gang members, her Family, close allies) the afflicted gain three taijutsu levels in each stat for actions that accomplish this goal. After the goal is completed, or three posts (whichever happens first), the influenced suffer three taijutsu levels worth of penalty to each stat for as many posts they had it active. During this three post period, genjutsu or genjutsu-like effects can't compulse a character not to follow the protection goal. RPCs may opt-out of the taijutsu benefit/penalty structure but still maintain the genjutsu protection. If Ranko is in a state of actual fear or panic, properly crying out in fear, the eerie bright light encompasses her body and her cries for help influence even aggressive attackers to pause their attack for a period of time dependent on their rank. Genin hesitate for two posts, chuunin hesitate for one, jounin hesitate for one action (they give up an offensive action for the post). Sennin aren't particularly affected, but they do hesitate for a moment. This effect is broken if the influenced becomes attacked. This only ever affects a person once per lifetime. A sukeban is a “boss girl”, suggesting a female bancho (school gang leader). A souban rules several schools and have control over other banchou. Like other Beast Master style combo archetypes, this archetype grants the regular benefits of “Leader” as well as an added benefit to represent specialization. The Sukeban Souban’s retainers that are sukeban themselves can gain the benefits of Keisei Kobun orders. Orders for a bonded retainer are always considered soft. A sukeban miko has miko powers, and gains independent miko usages and levels from her Leader. Her taijutsu special techniques still use the Leader’s jutsu usages. The Sukeban Miko gains the benefits of the Sin-Eater archetype. “Once per thread, the miko calls on the spirits to alter causality, allowing her to redirect the effects and injuries of any one attack to herself. As a ritual, she may lay hands on a recently deceased corpse and see the last five minutes of their life.” The attack redirection only applies with the special requirement: “Protecting the Sukeban Souban”. The Sukeban Brawler is a “Five Minute Hero”. They may take the Celestial Gates, and can open their gates for four consecutive posts per thread with no penalty. Her gates then automatically shut down without crippling the user (unless she uses the final Death gate). Taking advantage of the “Quick Start” ability of Kai-Mon, the Sukeban Brawler flickers from one position to the other, more quickly than the eye can follow. During Body Flicker, attacks seem to harmlessly pass through the body as the Brawler dodges then returns to her original position immediately. When attacking, the Brawler is only visible each time their foot hits the ground in their approach, appearing to “flicker step” towards their target. If their opponent’s speed is superior to the Brawler’s, she’s merely just blurry. By using a “Kawarimi” usage, so long as the Sukeban Souban is in reasonable range, she can immediately appear before the Souban to face-tank an attack directed towards the Souban. This instant “replacement” damages the muscles of the legs, rendering her incapable of reasonable movement the next post. She can hobble, but not engage in combat theatrics. This penalty applies despite “Sukeban Brawler / Five Minute Hero” suggesting she can’t be crippled by her gates. The Sukeban Samurai Dropout is an “Anlace.” Once per thread, she can imbue her weapon with a “cut-all” property, with an additional charge for every 10 Reserves. This cut-all property allows her to cleave through any solid objects as well as ninjutsu equal to her Taijutsu Training minus one. Unlike traditional Kaiki styles, the Kazarikiri techniques describe a method on how to intimidate and cow your opponents into submission, rather than becoming an effective assassin. A prison technique taught to other members of the Family to better protect them on these cold streets, Hidden Shank produces a Hidden blade from its hiding place for a sudden attack. The user goes from appearing defenseless to threatening in a single breath, suddenly changing the momentum of combat. This can be enough to scare off attackers who thought they were striking a defenseless girl. This requires a weapon with the "Hidden" modifier no larger than the size of a Medium Blade. Using Misdirection from the Kaiki school, the user holds their blade out at an angle to threaten with the cutting edge. When the aggressor makes a move to disarm the knife, the user uses the attack's momentum to flow underneath the attack and toss the target over their shoulder, judo-style. Using the momentum and weight of the attacker against them, this allows even a small girl to topple a large man. Tossing glitter from the pockets or stomping up dust from the ground, the user momentarily obscures the vision of the attacker. The precision here is what makes this a special technique -- the glitter or dust strikes sure for the visual sensory organ of the target (be it eyes or goggles or a construct or animal's equivalent), rendering the user's vision obscured for a post. Suddenly revealing a portion of their body, the user uses some of the hypnotic body movement of Kaiki to distract their opponent for a moment -- either revealing a terrifying Yakuza tattoo or skin better reserved for an intimate encounter. During this moment of distraction, the user lashes out with a sudden series of cuts, aiming for the eyes or any exposed flesh. Last edited by Virtual Dream; 05-18-2018 at 10:21 PM..
Special: Once per thread, the Desperado can completely ignore all rules of damage for a single post by virtue of an innate response from their Celestial Body. This can mean completely ignoring a point blank hit thanks to rapid regeneration, or going hard in the paint and ignoring grievous, crippling injuries to move and strike as normal by a hasty patch-work repair (as with the Daredevil archetype special), and so on. By expending a Kawarimi Usage (and a Stage 1 Jutsu usage), the Desperado can repeat this feat up to two more times. The Sanada Desperado is a tireless warrior, who selflessly throws herself into the chaos of combat to protect her friends. She has a simple zen mantra: "Nana korobi, ya oki!" Fall seven times, get up eight. With this adaption, the entirety of a shinobi's inventory (inclusive of the shinobi kit) can be stored "inside" of the Sanada's Celestial Body. This effectively works like the "weapon seal" option, appearing from the flesh on command. Items can be partially protruded from the body and then absorbed again as needed. This does not make copies of any items - - the user still runs out of items in the shinobi kit at a regular rate, and can't produce any copies of their registered items. The Sanada takes a powerful defensive stance and rapidly extends a series of rotating, drill-like spears from all around her body that extend about the length of a typical katana, unable to move while these spears threaten all that would come into her personal space. She has enough control over these spears to the point where she won’t accidentally impale a target, but they boil and erupt out of her skin in a different pattern each time, rendering it a successful defensive technique under repeat assault. This technique allows the Sanada to create these drill weapons with her other evolution and metamorphosis techniques inside the Sanada list. Drills are blades equal to the length appropriate to the technique, which spin rapidly for additional piercing power, but are easily snapped and broken. Drills do not confer a specific mechanical advantage, merely a cosmetic one. Stage 5: These drills come out about the length of a spear. The flesh splits open from one of the Sanada’s limbs, and the bone and meat beneath rapidly reconfigures to a large, spinning drill, spinning under the power of a fleshy motor organ at the base. As the drill spins up to full speed, some of the excess daughter cells passively created by Souseiki start to burn with sparkling lights, releasing intense amounts of power. This drill has destructive piercing capabilities similar to Chidori, and it can clash handily with other strike-type ninjutsu techniques where appropriate (such as Rasengan). Rather than the enhanced speed of Chidori or the incredible knockback power of Rasengan, the Sanada’s Drill can be detached inside of a hit target or launched like a projectile and explodes afterwards as the remaining cells of the Sanada detonate their chakra all at once. The Sanada pays for this payload by sacrificing the materials used to make the drill - - leaving a bloody, bleeding stump in the wake. A deadly technique that can kill the user of the chakra isn’t molded to perfection, declared a “forbidden technique” by a Hokage in the past. This technique was rediscovered and, combined with the Sanada Clan’s ability to self-regenerate, has been developed into a powerful supportive art for the most reckless of the clan. After forming a series of mudra, ending on the ninja handsign for dragon, the very skin of the shinobi becomes a deadly, burning weapon. Hairline orange cracks appear on the surface of the shinobi’s body, that split and erupt like small rivers of lava from head to toe. When engaged in personal combat, the shinobi’s skin erupts in katon splutters of blood and flesh when struck or impaled, sticking to the striking limb or weapon like wet fire. This napalm-like effect persists until completely cleaned away, a slow-burning jelly that can slowly burn through flesh and armor. Some victims, desperate to survive this technique, have been known to cut away affected limbs or tear off their clothing before it impacts their body. The pain from this technique can be ignored with a single Stage 3 Usage of the Sanada Clan’s Shikeshou (Nervous Disorder), but the burning flesh must be constantly repaired each post this technique remains active with a constant Shinsei (Rebirth), costing a Stage 3 usage each post, or the flesh will burn and harden and become useless for this technique. This technique lasts until it’s willed to stop or the shinobi is knocked unconscious, or they run out of Stage 5 charges (even though this technique only uses one Stage 5 usage to activate.) Without Shikeshou, the self-inflicted pain halves the shinobi's Taijutsu Speed Scaling, and without regeneration, this technique can only be active for a single post before the skin no longer can contain the technique's effects, making it historically a last-ditch method to kill a target already performing a final blow on the user. Special Notes: Other techniques that might reduce the pain (such as Katon's Fire Resistance, or Medical Techniques) can also dismiss the pain penalty, as well as other forms of healing (such as Medical Techniques, other Bloodlines, curse seals, whatever) if someone other than a Sanada attempts this technique. However, it should ALWAYS require extra jutsu usages (either yours or a supportive ally). After performing a series of mudra, ending on the shinobi handsign for rooster, a flaming scarf appears around the user’s neck, flowing freely behind them even without the presence of the wind. Notably, the scarf doesn’t cast any light or catch any mundane items aflame. This “cloak” remains active until the user dismisses it or runs out of Stage 5 charges. It wraps around the user to burn away any Stage 4 Ninjutsu (or lower) attack that the user can sense (but it does not act independently from the user), and can be immediately, passively refreshed with an additional Stage 5 usage. The scarf’s end can be thrown, growing from where it wraps around the user’s neck, to protect an ally from ninjutsu as well. This technique can be prematurely ended if it’s snatched from the user’s neck, but it erupts with the force of a Stage 3 Katon when it does - - immolating both the attacker and the user in a singular pillar of flame. Last edited by Virtual Dream; 03-31-2019 at 07:04 PM..